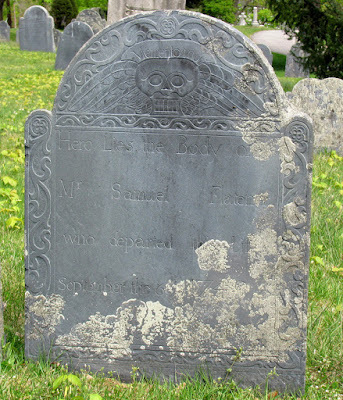 Samuel Fletcher (1684-1749) is #294 on my Ahnentafel List, my 6th great-grandfather, who married #295 Hannah --?-- (1689-1759) in about 1712 in Chelmsford, Massachusetts. Samuel Fletcher was born 5 September 1684 in Chelmsford, Massachusetts, the 5th of ten children of Samuel and Hannah (Wheeler) Fletcher of Chelmsford[1-3]. He married Hannah --?-- in about 1712, probably in Chelmsford. They had eight children born and recorded in Chelmsford between 1713 and 1725, and one in Westford in 1729. Samuel's father, Samuel Fletcher, wrote his will in 1713 and stated that his son Samuel was to be given several parcels of land in Chelmsford near Stony Brook, but not the homestead, and that the son Samuel was to pay money to his step-mother and three of his sisters as their portion. After the father Samuel died in 1723, the court refused to prove the will. It is unclear if the son Samuel received any inherited land. The town of Westford was set off from the town of Chelmsford in the 1729 time frame, and Samuel Fletcher Jr. was recorded in the town tax records in 1721. There are no probate records for Samuel Fletcher in the Middlesex County Probate Court records. 1. Massachusetts, Town and Vital Records, 1620-1988, digital images, Ancestry.com (http://www.ancestry.com), Chelmsford Births, Marriages and Deaths, Samuel Fletcher birth entry, image 359 of 1719. 2. Town of Chelmsford, Massachusetts, Vital Records of Chelmsford, Massachusetts to the Year 1850 (Salem, Mass. : The Essex Institute, 1914), Births, page 61, Samuell Flecher entry, son of Samuell and Hannah. 3. Jim Tipton, indexed database, Find A Grave (http://www.findagrave.com), Fairview Cemetery (Westford, Mass. ), Samuel Flatcher memorial #35570366. 4. Vital Records of Westford, Massachusetts to the Year 1849 (Salem, Mass. : The Essex Institute, 1915), Deaths, page 277, Samuel Flatcher entry (age 66).